A new Cereals Event app will help visitors to this year’s event get the most out of their day by providing mapping, information about exhibiting companies and timetables for event features, demonstrations, seminar sessions and guided tours. Available to download from both the Apple app store and Google play, the app provides information about the event, how to get there and a host of frequently asked questions – as well as the ability to purchase tickets. “The app contains all the information you need for the event, including the exhibitor list and a map to help you find the stands and features that you want to visit,” explains Jon Day, event director. With a site covering 45ha, it can be difficult to see everything you want to in a single day. However, this year expert guides will take groups on a curated tour of exhibitors and event features relating to a specific theme. Farmers will have the opportunity to take part in four carefully curated tours, running on both days of the event, which will provide an insight into innovations, offer valuable advice and generate ideas to transform their farm business. One of the themes at this year’s event is Varieties and the Recommended List – cereals and oilseeds. 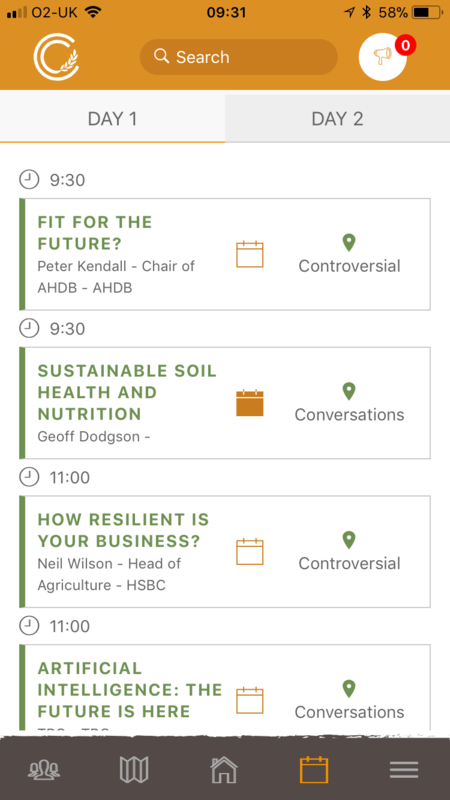 Experts from NIAB will take participants through the cereals and oilseed variety crop plots on the NIAB TAG stand before visiting the AHDB stand to hear about the Recommended List Look Ahead Debate, which takes place later in the day at 1.00pm. Weed control techniques will also be in the spotlight with a tour of different aspects of weed control in combinable crops – including technologies to improve accuracy and efficacy, and innovations in chemical and mechanical control. The tour will include Bayer, Corteva Agriscience, Syngenta, TeeJet Technologies and more. For those who want to see the latest technology, the Innovation in Action tour will showcase cutting-edge innovations and visit some of the exhibitors featuring in the Innovation Entrances – offering an insight into the ideas and tools aimed at revolutionising the arable industry. While the tours are both a great networking and knowledge transfer opportunity, there is also the chance to gain valuable CPD points by taking part. BASIS professional register members can gain two points per tour (up to a maximum of four points per day) while NRoSO members can gain two points by joining the weed control techniques tour. Ticket holders can book a place on a Guided Tour by logging in to the Cereals event registration website and selecting the Guided Tours tab, where they can select the tours they wish to attend. All tours are subject to availability, so ticket holders are advised to act fast. Guided tours and the new app are just part of the changes brought about by the new Cereals Farmer and Exhibitor Advisory Boards.